Arthur A. Levine Books, 9780439912990, 240pp. Gregory K is the middle child in a family of mathematical geniuses. But if he claimed to love math? Well, he'd be fibbing. What he really wants most is to go to Author Camp. But to get his parents' permission he's going to have to pass his math class, which has a probability of 0. THAT much he can understand! To make matters worse, he's been playing fast and loose with the truth: "I LOVE math" he tells his parents. "I've entered a citywide math contest!" he tells his teacher. "We're going to author camp!" he tells his best friend, Kelly. And now, somehow, he's going to have to make good on his promises. For every kid who equates math with torture but wants his own way to shine, here's a novel that is way more than the sum of its parts. Math-hater Gregory tries very hard to fit in with his math-loving family, even though what he really enjoys is writing and sharing poetry with his best friend, Kelly. His failing math scores mean that he has to spend summer at math camp, ruining his plans to spend the summer at author camp with Kelly. Still trying to find a way out, Gregory begins telling fibs to make those around him think that math camp is, indeed, the plan, and the ensuing mayhem caused by multiple fibs creates enough action and intrigue to keep readers fully engaged. The solution to Gregory’s dilemma involves poetry designed using the Fibonacci sequence, and each chapter heading is a Fibonacci-sequence poem that forecasts Gregory’s fibs. This delightful novel introduces a resourceful and inspiring young character, and many readers will relate to Gregory’s desire for creative expression and his yearning for acceptance. Everyone in Gregory's family adores math—everyone, that is, except Gregory. While his parents and siblings live for the yearly City Math contest, Gregory prefers writing, especially poetry. Gregory has promised his best friend Kelly that he will attend Author Camp with her, despite not having asked his parents. When his math teacher announces that Gregory may fail math, it might as well be the fall of Rome as far as Gregory's parents are concerned—and it results in Gregory constructing an outrageous lie that threatens to backfire. 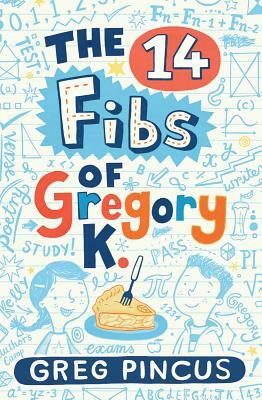 Gregory is a buoyant narrator whose extreme math phobia and obsessive love of pie (and definitely not pi) give his character an idiosyncratic shine. Hyperbolic details, like his mother's "Weird Wednesday" family dinners, are interspersed with passages from Gregory's extra credit math journal, where his ruminations on the Fibonacci sequence and "Fib poetry" give readers access to deeper reflections on mathematics, metaphor, and the places where they might overlap. Pincus's story explores struggles with friends, family, and learning while remaining exuberant and relatable, a winning equation.